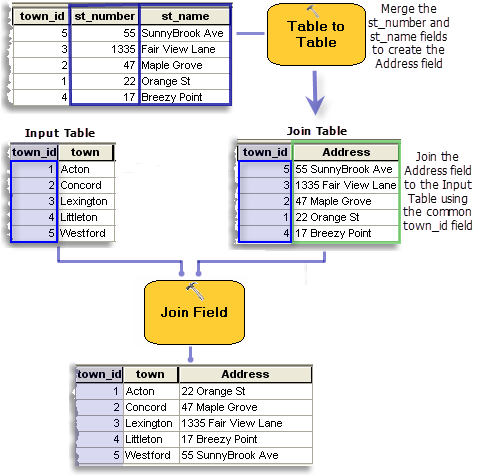 The Input Table can be a feature class (including shapefile) or a table. All fields in the Input Table will be kept during the join. Optionally, only selected fields from the Join Table will be added to the output. These can be checked under the Join Fields parameter. Records from the Join Table can be matched to more than one record in the Input Table. For more information on one-to-one, many-to-one, one-to-many, and many-to-many joins, see About joining and relating tables. If no fields are selected for the optional Join Fields parameter, all fields from the Join Table to the output will be joined. Joins can be based on fields of types text, date, or number. Joins based on text fields are case-sensitive. Fields of different number formats can be joined as long as the values are equal. For example, a field of type float can be joined to a short integer field. The Input Join Field and the Output Join Field can have different names. If a join field has the same name as a field from the input table, the joined field will be appended by _1 (or _2, or _3, and so on) to make it unique. 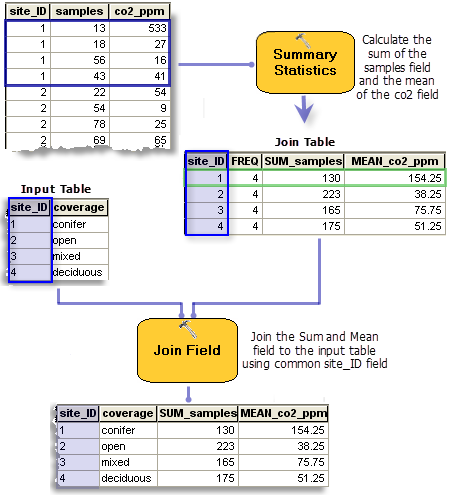 To account for join table values other than the first occurrence, start by executing the Summary Statistics tool using the Join Table as input. Summary Statistics allows you to summarize fields (for example, sum, mean, min). To merge two or more fields in the join table before the join, first export the table or feature class using the Table To Table tool and merge using the tool's field map. The table or feature class to which the join table will be joined. The field in the input table on which the join will be based. The table to be joined to the input table. 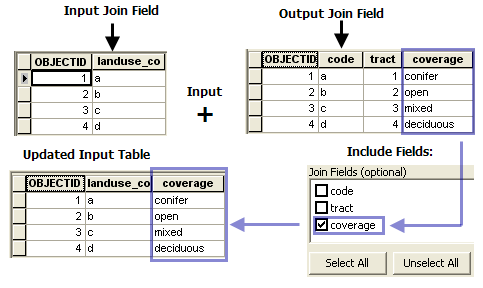 The fields from the join table to be included in the join. The following Python window script demonstrates how to use the JoinField function in immediate mode. This stand-alone Python script shows the JoinField function used to join a table to a feature class and only include two of the table's fields in the join.